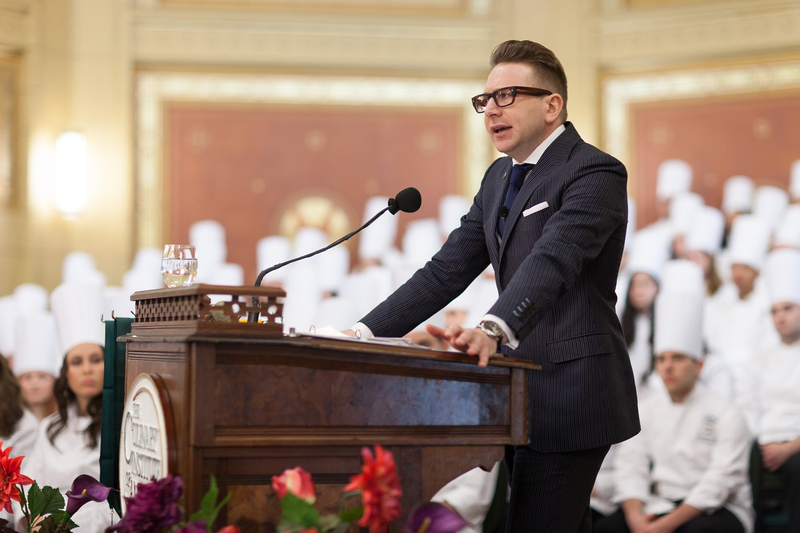 Hyde Park, NY – Chef, sommelier, and entrepreneur Stephen Asprinio returned to The Culinary Institute of America (CIA) on Friday, May 3, 2013 as keynote speaker at commencement ceremonies at the college's Hyde Park campus. The former contestant on the first season of Bravo's Top Chef and Top Chef All-Stars is a 2001 CIA graduate. Asprinio told 88 recipients of associate degrees in culinary arts and baking and pastry arts that their CIA degree gives them a huge advantage in a competitive job market. "You'll be going into a water gun fight with a bazooka," said Asprinio. "You are members of the most powerful and elite—but not elitist—alumni group in the world. You hold the future of the hospitality business." But with that leg up comes a warning: "Put your head down and work," Asprinio reminded graduates. "Show and lead by example, but not by flaunting." Asprinio, 31, has already accomplished much in his career. He was the youngest person ever to pass the United States Sommelier Association certification exam, at age 19. By 22, he was sommelier at Caesar's Palace in Las Vegas, then wine director for fellow CIA alumnus Michael Mina at Nob Hill in Las Vegas. His first restaurant, Forté di Asprinio in West Palm Beach, FL, received numerous awards and accolades after its opening in 2008. Asprinio's latest concept, Pizza Vinoteca, launches later this year in New York City and Arlington, VA. His first book is scheduled for publication this year as well. After earning his CIA degree, Asprinio completed his bachelor's degree in hotel administration at Cornell University, and he has served as emcee of the CIA-Cornell Golf Classic that raises scholarship funds for both colleges. He has been named one of the Top 100 Power Players by Florida International magazine for his contributions to the hospitality industry.